Hidden from sight, among a colony of freestanding conch cottages, surrounded by lush tropical landscaping, you will find Hidden Treasure. 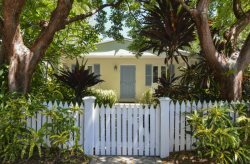 Truly a treasure, it is the sister cottage of Island Style, owned by two sisters who share a passion for Key West. It features every high-end amenity that you could possibly desire. Two master bedrooms, two full bathrooms, high-end stainless steel full kitchen, huge flat-screen TV with surround sound, washer/dryer, Wi-Fi, gas grill, and a shared oasis-style heated pool. Upon entering the large private deck, you will sense that you are about to embark on a special getaway. Your eyes will be drawn to the tropical landscaping surrounding the private pond. On closer inspection, you will notice the exotic bromeliads and orchids. If the bananas are ripe, feel free to indulge yourself. Hidden Treasure features two king beds and a queen sleeper sofa, air conditioning, vaulted ceilings with Bahamian ceiling fans, a full kitchen with glass top burners, a combination micro/convection oven, and enough crystal glassware to serve refreshing Margaritas and Hemingway’s favorite: Mojitos. All the modern amenities don’t distract from the classic Caribbean ambiance. Bright colors enhance the handmade furniture and artwork selected from local galleries. Double French doors from the living room and master bedroom open to the private deck with unique covered dining area, loungers, and two outdoor tables. Fun-loving people fall in love with Hidden Treasure! It is the perfect spot to unwind within walking distance of all of Key West’s charms. The maximum people allowed in this property is 6. If there are more than 6 people are in your party upon arrival, your party will be asked to leave without compensation. Parking: Limited off-street parking available on a first-come, first-serve basis; on-street parking also available. Sleeping Arrangements: 2 king beds and a queen sleeper sofa. Pets: Pets welcome; some restrictions apply. Location: 2 blocks to world famous Duval Street in the heart of Old Town Key West. Individual making the reservation must be 25 years or older with proper identification and be an occupant of the property. The maximum people allowed in this property is 6. If there are more than 6 people are in your party upon arrival, your party will be asked to leave without compensation. Violation of ANY house rules will result in your party being asked to leave without compensation.